Patches showed up on our doorstep on New Year's Day, 2009. It was way below zero, but the sun was out for the first time in days. Despite the cold, the cement of our steps was dry and warm--and she stretched her boney body out there to lie in the sun. We brought her in, warmed her, and fed her a bit of canned food. A trip to the vet revealed that she was over 10 years old, had cataracts, was partially deaf, had a deformed right leg and was missing part of one ear. She also had thyroid disease and kidney disease. She may not have been much to look at, but she was the sweetest little cat I have ever had the pleasure to know. She was happy to have a warm bed a full tummy, and an owner who loved her, and she brought much joy to our family for the short time she was with us. 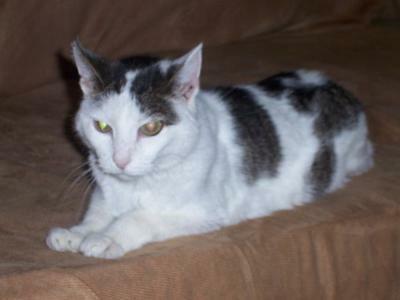 Patches passed away on February 14, 2011. I know she is chasing butterflies in fields of catnip, but I will miss her forever. She was without question the sweetest cat I have ever known. Wow !!! The same EXACT THING HAPPENED TO ME EXCEPT IT WAS ON JANUARY 2nd ! AND SHE/ HE IS SAME COLOR'S !!! OREO...lol WHITE WITH BLACK SPOT'S. I'VE HAD HER A COUPLE OF DAY'S NOW. She looks like a gorgeous cat it was sweet of you guys taking her in aside from all the health problems she had. Glad she had a good home for two years. She was beautiful! I bet she is chasing butterflies in Heaven.